Nearly every electronic project needs a power supply. Why spend a lot of time scrounging the parts and hand wiring one for your next project when you can build one up from one of our kits in just minutes? These kits come complete with a PCB, heat sink & hardware, 78xx voltage regulator IC and capacitors. Order the VR3-Pack so you will have what you need when your next project idea comes along. Mix or match voltages. 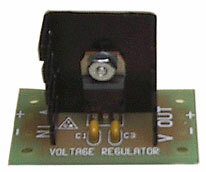 Each kit in the VR3-Pack contains 3 individually packaged voltage regulator kits with 1 set of instructions. Size: PCB 1" X 1.5"